No Room at the Inn this Winter? If I were to ask you what the core function of a watch is, undoubtedly your response would be that it is to keep you informed of the time. Whenever you see someone glance at their watch it is inevitably due to them checking the time or perhaps they are just admiring it if it happens to be a particularly stylish, desired watch brand. However, this may be set to change. As powerful as it is to dictate the time, and therefore people’s schedules, watches are set to become even more influential this year as they too are “smartified”; opening them up to a whole range of new potential functions. Yes, as you may be aware, one of the most hotly anticipated products of the year has to be a certain Apple Watch which is to be released near the end of April (there may be a queue beginning already; sleeping bags and coffee flasks at the ready!) and it is set to revolutionize the travel industry. You may wonder how the travel industry and a watch fit together? Well unfortunately, technology still has not progressed to a level where time travel has become reality and so the ability of the smart watch to transport you to another time, past or present, is sadly not the case. However, what is true is that even though the Apple Watch has not been released yet, already many an app from major firms has been designed for it. The likes of Uber, Evernote, Expedia, Trip Advisor, KLM and easyJet have all invested in designing an app and consequently, this is where the impact of the watch on the travel industry can begin to be inferred. So, what changes can we expect? There is the potential that room key cards are set to become old-school as giant hotel brands like Starwood design apps that allow guests to use their watches to check-in and to even let them into their room. Similarly, if you happen to be following a person who may be radiating tourist signals and who is happening to be glancing down at their watch every other street, it is quite likely that they are using a navigation feature on their watch to help them find their way. Likewise, you may walk into an airport to see everyone looking down, not at their phone, but at their watch as they look at flight apps which will be reflecting live-time departure and arrival times; delays and the length of the line in security. 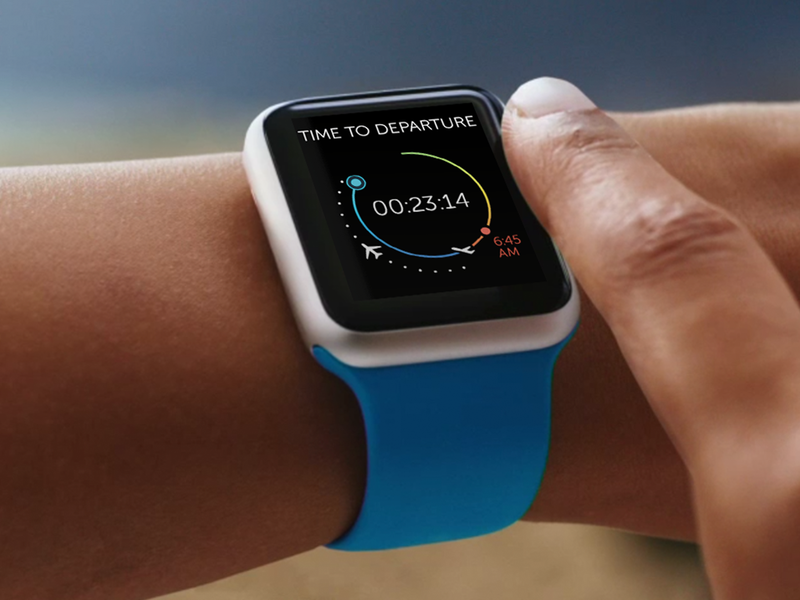 Inevitably, watches will even become the new form of boarding passes and checking-in to flights as apps are already in progress regarding this. The watch could even become a real gift for business travellers as apps like Evernote will allow them to dictate all their notes, thoughts and plans into the watch so it can be transferred to that renowned Cloud and then be accessed later on a different device. Above all, the watch could revolutionise the industry due to the way it will totally transform the customer experience and how travel companies deliver their service. As was reported by TNOOZ, Air New Zealand has already designed an app which allows guests in their airport lounges to order drinks, just reflecting the potential the watch could have in keeping companies in touch with consumer’s movements and needs. It is crazy already to think of the potential power that a mere watch could hold over our lives although it has been reported by the Telegraph that only 25% of British citizens think that wearable technology will enhance the quality of their life. It will definitely be an exciting development to watch unfold (no pun intended) and to see the impact it will have on the serviced apartment industry. Even though I am really intrigued to see just how far the watch’s power could stretch, it is a little sad to see another piece of technology that will be added to people’s digital portfolios alongside Kindles, Phones, Laptops, Tablets etc. It feels like everything is getting “smartified” and that there is already an abundance of devices that consumers are hooked into without adding a classic staple like a watch in the mix; particularly as watches tend to be bought for significant relations on special occasions or are passed on as heirlooms-they can have sentimental value. Consequently, being one of those classed as a technology “laggard” when it comes to product innovation, I am sure it will take a few years for me to be persuaded otherwise to invest in a smart watch. Personally, my regular average watch seems to be doing a pretty good job at getting me on time to places as it is, and at a mere fraction of the price. Conversely, my manager is eagerly awaiting the great unveil of the Apple Watch; reflecting the diverse range of opinions regarding technology’s latest baby. Therefore, we are intrigued to hear what all our followers and readers think; will you be fighting your way towards the front of that queue on Apple Watch launch day?